Having your lawn cut by a robot may bring visions of The Jetsons, but the Stihl iMow robotic mowers don’t require a clunky floating robot in an apron. While robotic mowers are more of a fringe product, they are growing in popularity. Let’s take a look at what Stihl has to offer. For most of us, the draw of a robotic mower is simply not having to spend Saturday cutting the lawn. For others, it’s about having a fresh-cut look every day. The Stihl iMow promises to deliver both. Stihl uses an algorithm-based mowing pattern (no, that’s not a dance Al Gore came up with after his invention of the internet). It looks like it’s completely random, but it’s actually using a complex mathematical pattern to ensure that every part of your lawn gets cut. You get to determine when your Stihl iMow is actually mowing. It’s incredibly quiet, so many people go with nighttime mowing to avoid the times you’ll be enjoying your yard. There’s a rain sensor built-in, and your iMow can avoid mowing during the rain and program itself to make up the difference later. If you have a lot of rain like we do in central Florida, the mower can push through and mow by turning the sensor off. The mower is perfectly capable of getting wet, it’s just tougher to cut wet grass than it is dry, so it might not get as much done before heading back to the charging station. Using an electronically controlled brushless motor has its benefits. One is that the blade is ground on both sides. Every time the iMow stops the blades, it reverses their direction to give you a more even wear. Once you have the guide wires installed, you can add an edge mowing option to give you a clean cut in the areas that your landscaping allows. 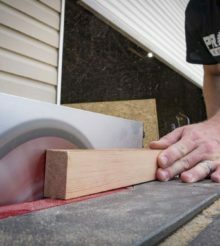 It’s not an edger, though, so you still need to hit your hard edges when you trim. Like all robotic mowers, sensors let it know when it comes across the guide wire or is about to run into an object. When it approaches something other than the wire or if someone picks it up/tilts it, the mower automatically shuts off the blades so no one gets hurt. While there’s no GPS to track the mower or determine its mowing path, a PIN system helps prevent theft. When you enable it, the mower requires you to punch it in before you can access the menu. Taking the battery out or resetting the unit won’t help, either, so be sure you don’t lose it! You can choose between two models depending on what size lawn you have. The Stihl iMow RMI 422 P is what you’ll use on lawns up to 1/4-acre. The Stihl iMow RMI 632 P covers lawns up to 1 acre. They differ significantly in their brushless motors and batteries. The smaller unit has a 60-watt motor while the larger is more than 3 times more powerful at 185 watts. The battery is somewhat curious. Rather than using two different capacities on the same voltage, the 422 uses an 18.5V battery and the 632 uses a 29V pack. While it’s odd to see tools in the same line with different voltages, it’s not like you’ll be swapping batteries out while you charge, so it’s not a big deal. Well, not a big deal other than there is surely a much higher cost for the larger pack when it’s time to replace it. As far as capacity goes, the 422’s 80 watt-hour battery will run for up to an hour. The much larger 194 watt-hour battery in the 623 will run up to 2-1/2 hours. Compared to Husqvarna’s robotic mower lineup, both Stihl iMow models have a pretty attractive price. The 422 runs just under $1300 while the 632 is just $700 more at $2000. But that doesn’t include installation. Stihl tells us that it’s possible to do your own installation, but they highly recommend letting your local dealer handle that for you. So add another $700 to your price. You mentioned central Florida’s rain. How well does the Stihl perform on Central Florida’s grass…St. Augustine? I really wanted to read this article but I couldn’t go on after the Al Gore joke.